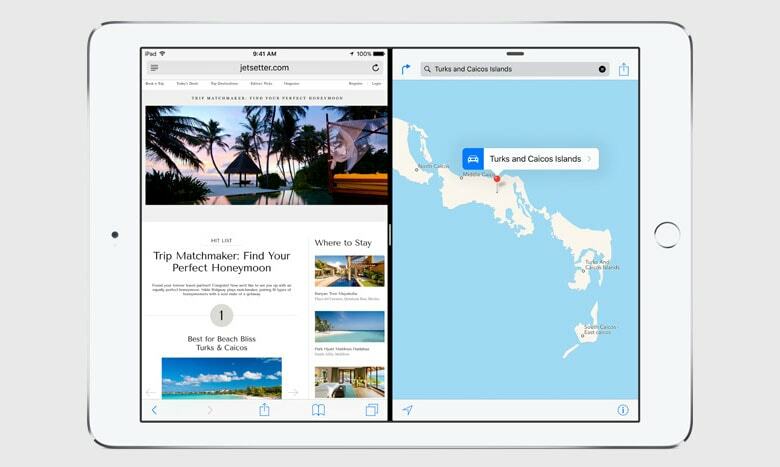 Remember last year when hackers showed that iOS 8 had a hidden split-screen mode? I have some good news: We're finally going to get to use it. iOS 9 is just reaching beta release today, and along with a new trackpad trick, smaller footprint (only 1.3GB to upgrade), and the new Apple News app, we're also going to gain a new multi-tasking feature. Pocket Now, PCWorld, and Liliputing report that the next iteration of iOS will sport new features which will let users run two apps at once (split-screen), play a video in a pop out window, or temporarily open an app over an existing app (slide-over). Apps can share equal screen space, or you can give more display real estate to one if you so choose. Multi-touch input will allow you to work with both at the same time, and drag-and-drop content between them. Not every app needs so much space, though, and sometimes you want to consume content from one while working in another. For that, Apple’s bringing iOS 9 picture-in-picture support, letting you detach videos and keep them on top as you interact with other apps, or even keep their audio active in the background. Most of the new features are going to be available on the iPad Air, Air 2, mini 2, and mini 3, but the more resource intensive split-screen mode is only going to work on the iPad Air 2. The features are obviously going to have to be integrated into apps before we can use them, but that is probably going to happen by the time the first iOS 9 public beta is released in July. The full version of iOS 9 is due to be released later this year. Do you know what struck me about this? That even with the massive amount of computing power in the iPad Air, it's still not up to the task of running two apps at once. I find that more than a little silly, and it's also frustrating. I upgraded to the iPad Air because I was expecting to get the new multi-tasking feature, but I and many other tablet owners have been shut out. If I remember correctly, the iPad Air 2 has 2 gigs of RAM. All other iOS devices have 1 gig of RAM at most. Apple is probably limiting the multitasking features because it fears that users will not have an optimal experience if they run into a RAM ceiling quickly and or frequently. RAM is the most likely limitation, yes. Also iOS 9 will only use 1.3 GB of memory instead of the 4 GB it uses now. I’m looking forward to that, actually. I think what Apple actually meant was that the amount of available storage space required to upgrade has decreased. I’ve had to help a few people who have maxed out their storage with photos and videos. The easiest thing is to plug the devices into iTunes and upgrade iOS that way. I really doubt that the on device storage requirement of iOS shrunk to 1.3 gigabytes, even with the new “thinning” coming to the App Store. I had upgraded from an iPad 2 (busted screen), so the Air was more than enough for me. I think Apple is trying to come up with a reasonable justification to push people into upgrading their iPads. While it might have been possible to make these features work for the older versions, they might not have worked as well, or been slow. But it sure doesn’t hurt Apple if people find themselves motivated to upgrade to new hardware for these cool new features. This might help reverse the trend of slowing iPad sales. I think it will only be really useful to power users.